I have written here before about ZK, the AJAX library for Java. One of my job requirements recently has been to find an alternative to our in-house developed Intranet, which is long since unmaintainable because of lack of documentation and employee turnover. My solution? Liferay Portal Server. Liferay Portlets are simple enough to develop using traditional Java servlet methodologies, but when you get into AJAX the complexity level increased by an order of magnitude. So, the purpose of this article is to allow you to get started writing portlets using ZK in a jiffie!! My development environment is Eclipse Ganymede. I have installed the ZK Studio plug-in, the Tigris Subclipse Subversion plug-in, and the Web Tools Platform. Once you have this, you have a good starting point. You can add other things like Java Persistence, Hibernate, JSF, and Struts; but the basics are enough to write simple portlets. I am developing for Liferay version 5.2.2 (Augustine). I downloaded the Liferay/Tomcat6 bundle and extracted it into my home directory (Ubuntu/Linux). Once it was extracted, DO NOT start the server immediately. You have to make some configuration changes before you launch the service the first time. For me, these changes included setting up Active Directory authentication with our Windows domain controllers, changing from the embedded HSQLDB database to PostgreSQL, and setting some more sane defaults for the WebDAV file access. The aforementioned changes are done by creating a portal-ext.properties file. In the folder which was created from extracting the Liferay/Tomcat6 bundle, look for the <Liferay>/tomcat-6.x.x/webapps/ROOT/WEB-INF/classes folder. Create a new text file in this folder called "portal-ext.properties". Below is a sanitized version of my portal-ext.properties file. # Settings which allow our users to authenticate with their Windows username & password. # Various settings which you can look into by downloading the Liferay source, but probably are very specific to our environment. # Disables "Updates Available" messages in Liferay. You could easily just copy my portlet.xml file and modify a few things and it would work. You can even create multiple portlets in a single WAR file by replicating the "portlet" node with more portlet instances. The ZUL file listed in the XML settings is the file which will be displayed when the portlet is viewed in Liferay. 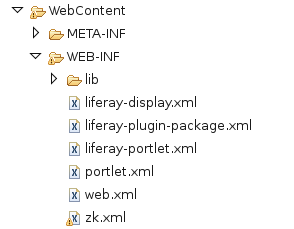 Last, but not least, is the liferay-plugin-package.xml file. This file tells Liferay how to deploy the portlets within it's environment. Just be sure that you create a new <portlet> node for each portlet in the portlet.xml file and you should get the hang of this fairly quickly. It will not even show up as visible, but it is enough to prevent two ZK portlets on the same page from interfering with each other. and replace the existing components with your new components. If you try to redirect the user to another ZUL page, it will redirecto to a non-existant generated URL. Save that file in your WEB-INF for your new portlet WAR file and you are good to go! It took me about 2 weeks of constant searching to figure out these tips, so I hope that they are useful to a lot of people. If you have questions, feel free to post and I will try to answer them to the best of my abilities. I'd love to stay in touch with your LR developments. Could you attach the sample portlet of this article. it would be possible to have the source code example. I currently looking at what UI frameworks to use for developing Liferay portlets. I'm looking at Icefaces but your article has lead me to check out ZK. I'm struggeling with zk events in liferay since days now. Did you manage to handle them correctly. Any tricks? Thanks for the article. It took me 90% of the way. I've followed your article and all worked correctly. Really thanks, very useful! a ZK portlet to the portal the banner of Liferay portal slightly shrinks (a small white border appears at left and right). Any ideas?